'The Spider' is already rehabbing his shattered left leg, just nine days after his fight against Chris Weidman at UFC 168. It has only been nine days since UFC 168 and Anderson Silva has already begun his recovery process. ‘The Spider’ posted a photo on Instagram on Monday showing the beginning of his physical therapy. 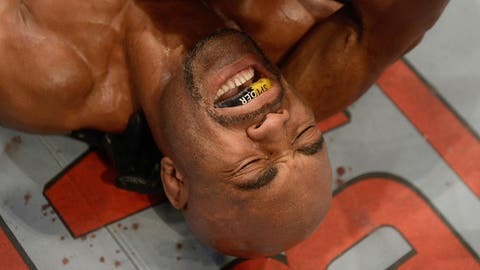 Silva, the pound-for-pound best MMA fighter of all time, broke his leg in gruesome fashion on Dec. 28 during his UFC 168 middleweight title fight with Chris Weidman. In the pic, Silva is laid up on a bed with a workout noodle tucked under his left leg. There’s a medicine ball between his legs and an apparent physical therapist wearing a Silva Nike shirt tending to the bad gam. The caption on the photo is in Portuguese and translated it says: "Thank you for the affection of all, I’ll be good I promise you that I will." Over the weekend, reports surfaced that Silva has been telling people he won’t retire. His manager, Jorge Guimaraes, told TMZ that Silva "will be back."